Give creates some custom user roles, and capabilities to provide you with more flexibility in how you allow your website users to manage and see your donation-related data in your admin area. 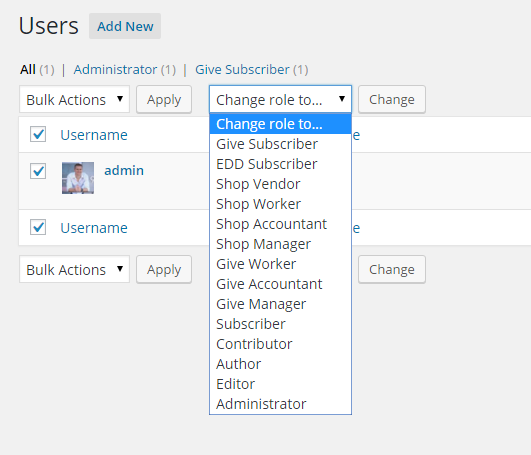 WordPress comes with some default Roles: Admin, Editor, Author, Contributor, and Subscriber. When you create a new user at “Users > Add New” you choose one of these roles for that user. The user’s role determines what they can or can’t do in your websites admin screen. Capabilities are attached to roles and are the things that give or remove that users ability to do something. Some common capabilities include “publish posts”, “update plugins”, “delete other’s posts”, etc. Give creates some custom user roles and capabilities to provide you with more flexibility in how you allow your website users to manage and see your donation-related data in your admin area. Below is a list of the custom user roles that Give creates upon install and what they do. This role is similar to a WordPress “Subscriber”, in that it only has the ability to “read”, never “write”. If you request or require your donors to register/login during donation then this is the default Role they are assigned. It is only for designation purposes. NOTE: You can change the default user role in “Donations > Settings > Advanced. Read more about that here. Think of the Give Worker as an assistant to the Accountant and/or Manager. They might be a volunteer within your organization who is capable and trustworthy, but you simply don’t want to burden them with the responsibility to see reports or manage Give settings. 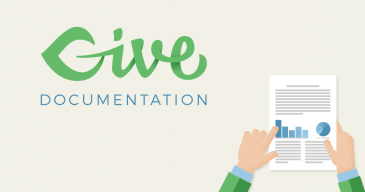 The Give Worker can manage everything about the Give Forms and Donations. They cannot see the following screens at all: Donation Details, Donors, Reports, Settings, Tools, Add-ons, Subscriptions (Recurring Donations only), Updates (only visible when Give updates are available). 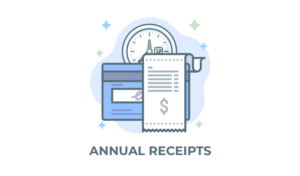 The Give Accountant is exactly what it sounds like — a role dedicated to managing the donation-specific tasks in the Donations admin screens. The Give Accountant — contrary to the Worker — can only see Give forms, they cannot edit or delete them. They can also create a draft of a new Give form for a Manager, Editor, or Admin to approve. The screens that are most pertinent to the Account though, are: Donations, Donors, Reports, Tools, Subscriptions. 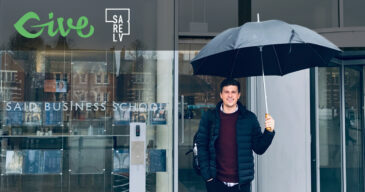 The Give Account can manage all things within all of those screens, enabling them to have full capabilities to get their job done. Note that they — like the Worker — cannot access the Settings or Add-ons screens. Think of the Give Manager like the Admin of Donations. They have access to everything within the Give admin screens. They can do everything that the Accountant can do, plus they are the only Give user role that can access the Settings, Add-ons, and Updates screens. Outside of the Give admin screens, a Give Manager can also create and delete their own posts and pages. They can add, edit, and delete any posts or pages they create. They also have access to the WordPress Import and Export tools within the Tools admin menu. To assign a Give User Role to a specific user, navigate to Users in your WordPress dashboard and select User(s). Specify the role via the roles menu and click “Change”. If you want to grant custom capabilities to any of your user roles, we highly recommend the free “User Role Editor” plugin. Once you install it, you’ll see its settings available under “Users > User Role Editor”. Here’s an animation showing how that is done.